If you’re looking for some cool and unusual way of serving up style, then the 9 serving boards in this post will definitely make providing hors d’oeuvres a lot more interesting. Featuring such eclectic designs as cloud shape, puzzle piece, 3 tires, these quirky serving boards will definitely have your guests chuckling at how their appetizers are being served. 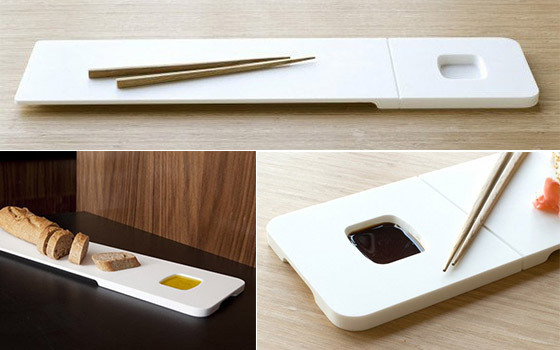 Masu Serving Board is an an elegant yet modern board to serve sushi and sashimi, cheese, or bread and oil. Its minimal platform presents the food, while a seamless basin holds the sauce accompaniment.Cantilevered edges create an illusion of floating, making the Masu a stylish accent piece for any modern party. The plate is a white solid surface made of hygienic and non-porous materials. The material does not support the growth of bacteria, and is completely dishwasher-safe. Where’s the beef? Here it is! Prime Cuts is built from perfectly marbled bamboo and cushy, durable food-safe silicone. Prime Cuts measures 10 X 9 inches, ideally sized for entertaining. The bamboo is naturally smoked to a rich color and embedded in food-safe pure silicone. Everybody knows all you have do to smile is SAY CHEESE! 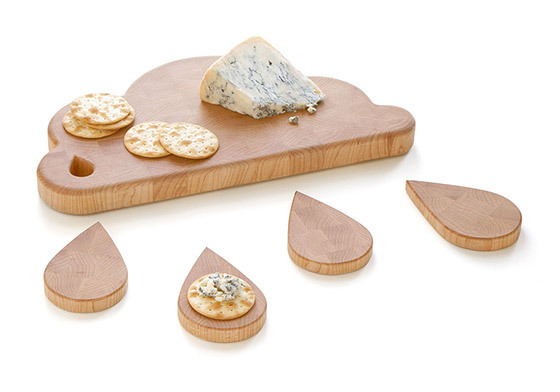 Fred thinks eating cheese is even better than saying it, so he presents this happy cheeseboard for your table. 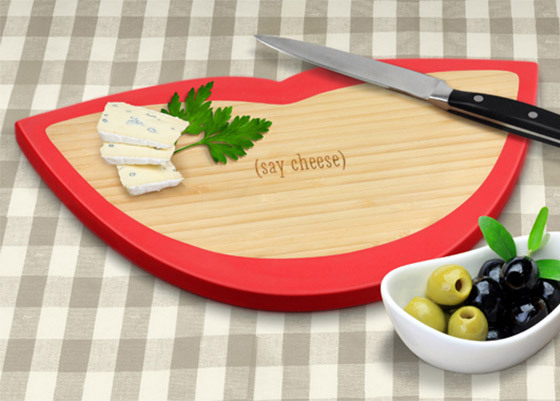 It’s crafted from sustainable bamboo with cushy, durable, food-safe silicone lips so you can serve your cheese with a smile! 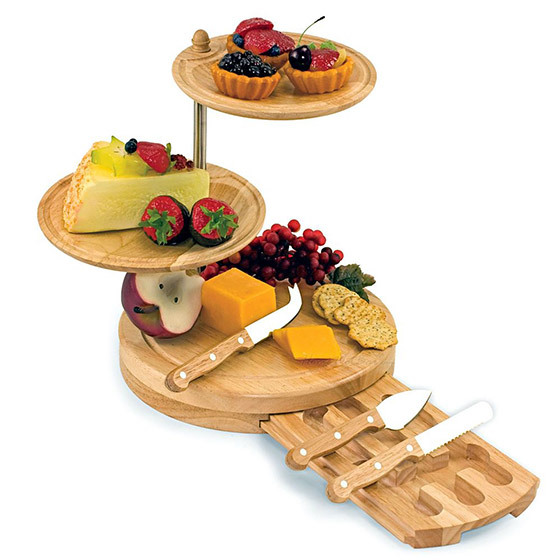 It is a three-tiered combination serving tray and cheese board with three cheese tools and two serving plates. The tiers are connected with two stainless steel poles (with screw ends) and are topped off with a wooden finial. Measuring 10″ x 10″ x 11.5″, it’s made of eco-friendly rubberwood, a hardwood that’s known for its durability and beautiful grain. 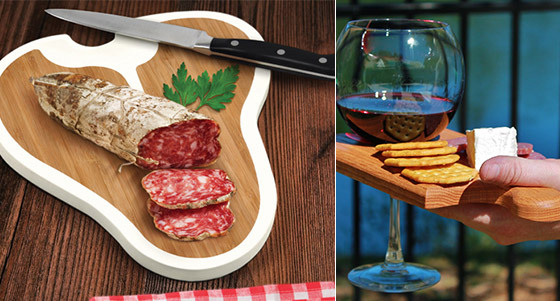 The two serving trays sit atop the cheese board base and swivel from side to side so you can create the most fitting and attractive food arrangement. 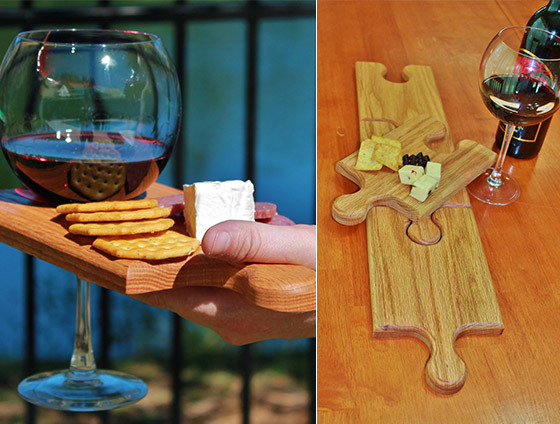 The rubberwood plates measure 7″ and 8″ and have a decorative groove along their edges to match the moat engraved on the cheese board below. 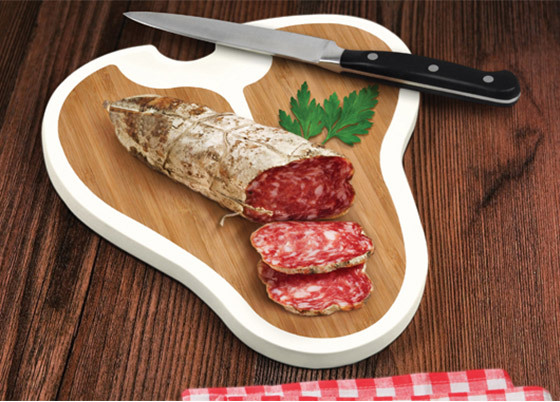 This beautiful board can be used as a cutting board on the back and serving board on the front. 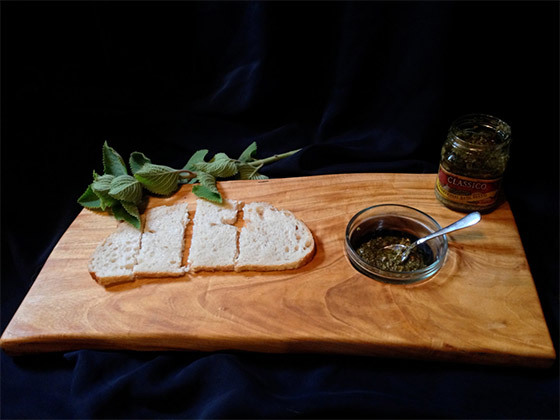 It makes a great board for slicing fruit and bread to serve with sauces or dips. The hole near the middle of the board serves dual purposes. First as a convenient way to hang and store your cutting board for display, and second, as a perfect niche for a small bowl to house your favorite spreads. Shower tree wood is meat safe and has natural anti-pathogenic properties. The wood was salvaged on the North Shore of Oahu and is a sustainable piece. This 18″ black wood serving board features 18 indentations for sauce or appetizer cups. 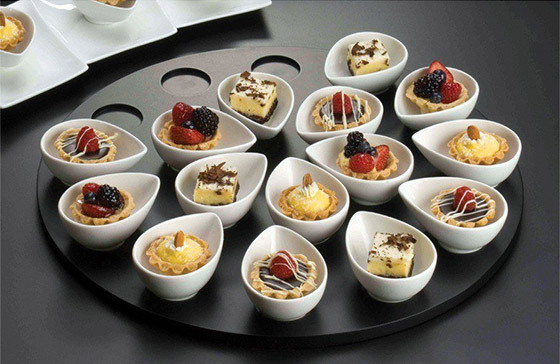 The serving board is ideal for serving sauce or appetizer sample platters at your restaurant, buffet, or next catered event. 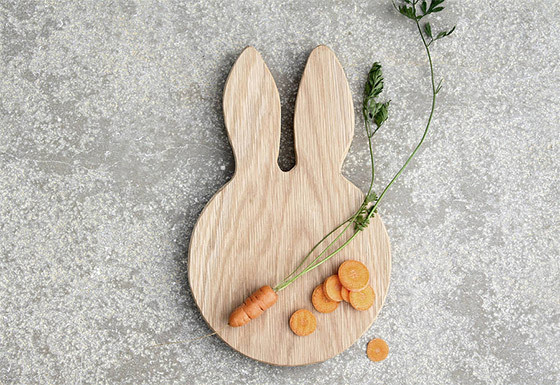 Bunny Ears is the contemporary fun alternative to a plate and great fun too. Perfect for serving healthy snacks and encourage tasting new foods.